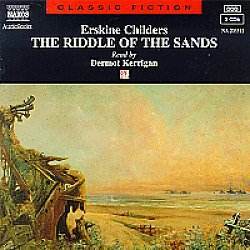 ERSKINE CHILDERS: The Riddle of the Sands. Music by: Schumann Read by Dermot Kerrigan. Naxos Audiobooks. NA205512 154m DDD. Erskine Childer's adventurous and romantic lifestyle could almost be transcribed into a novel! So it is no wonder that his famous 'Riddle of the Sands' should contain some sinister and uncanny predictions of a German invasion in those far off days at the turn-of-the-century. This time, Naxos have matched the thrilling and at times mysterious overtornes of Schumann's Fourth Symphony to accompany Dermot Kerrigan's spirited and atmospheric narrative. As Carruthers and Davies explore the remote stretches of German coastline with the Dulcibella, they come across two sinister Germans, Dollmann and Bartels, both masterminds in a plot to invade Britain. The risks and hair-raising escapades of the two are straight out of the smugglers books, such is the quality and sense of atmosphere created by Dermot Kerrigan's reading. He is particularly sinister in the description of 'A night-time visitor' and the mystical but painstaking adventures of 'Carruthers plays the spy'. The booklet also includes a few interesting maps that show the terrain and sea area which is absolutely authentic, the Sands appear prominent in these nostalgic reprints. Kerrigan's delightfully nasal and German sounding English is particularly atmospheric, and you cannot fail to build a certain resentment in your heart as the studious characters of Herr Dollmann and Commander von Bruning scheme their dastardly plans and offer help to our British heroes whilst laying the subtlest of traps to thwart their unmasking. Childers is master at creating tension and 'Riddle of the Sands' takes its place in the Naxos catalogue as one of the finest dramatizations of this spy-novel in the repertoire.